Delivers stunning definition and color for highly immersive gameplay. With 3840 x 2160 resolution and SuperClear IPS panel technology, this monitor provides incredibly sharp and detailed visuals. What's more, gamers are empowered with a wide array of customizable pro-style color settings for the accurate colors across gaming genres. Displaying more than 8 million pixels with a high pixel density, this 3840 x 2160 monitor delivers the ultimate in image detail and clarity for stunning, highly immersive gameplay. SuperClear IPS panel technology delivers the same screen image quality from above, below, the front, or the side. Features MultiPicture support for multitasking and simultaneous viewing of up to 4 video sources at Full HD 1080p resolution. Picture-in-Picture (PIP) and Picture-by-Picture (PBP) functionality is also available for increased productivity. 144Hz refresh rate delivers visual fluidity and awesome graphics even as quick in-game action unfolds. Leveraging VESA Adaptive-Sync connectivity, this monitor is equipped with AMD FreeSync™ technology that seamlessly synchronizes the frame rate output between your graphics card and monitor. This dynamic refresh rate effectively eliminates image tearing, stuttering, and jerkiness for smooth gameplay. To lock in that perfect angle necessary for drawn out epic gaming sessions, this monitor features a fully adjustable ergonomic stand capable of considerable swivel, pivot, tilt, and height adjustment. An integrated headphone hook keeps your headphones within arm’s reach, while a cable management ring reduces clutter around your gaming space.short: Displaying more than 8 million pixels with a high pixel density, this 3840 x 2160 monitor delivers the ultimate in image detail and clarity for stunning, highly immersive gameplay. Get a better view with a larger monitor. 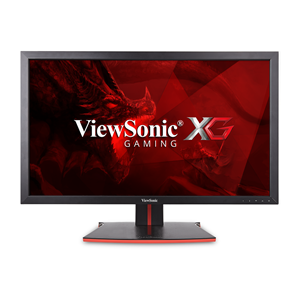 15" x 25.3" x 2.2"
The ViewSonic® XG2700-4K is a 27” 4K Ultra HD LED gaming monitor that delivers stunning definition and color for highly immersive gameplay. With 3840x2160 resolution and SuperClear IPS panel technology, this monitor provides incredibly sharp and detailed visuals. What’s more, gamers are empowered with a wide array of customizable pro-style color settings for the most accurate colors across gaming genres. This incredible alchemy of detail and color are fully realized with VESA Adaptive-Sync technology: a combination that delivers tear-free, picture-perfect gaming every time. A fast 5ms response time and low input lag also provides smooth screen performance free from blurring or ghosting. A Game Mode feature optimizes visuals for FPS, RTS and MOBA, and a black stabilization function helps target enemies lurking in the dark while maintaining rich colors and contrast. With future-proof DisplayPort and HDMI 2.0 to support 4K UHD resolution at 60Hz, this monitor is the pinnacle of detailed gaming, and maximizes the gaming potential of any PC. With unbelievable detail and color, this monitor provides everything needed for total game immersion. Future-proof HDMI 2.0 and DisplayPort 1.2a video standards support 3840x2160 resolution at an ultra-fast 60Hz frame rate—guaranteeing jitter-free multimedia, smooth screen performance, and true 4K Ultra HD picture clarity. For even greater, more robust connectivity, this monitor also includes two MHL input options, as well as four USB 3.0 charging ports for easy connection of peripherals and mobile devices. A Game Mode function opens pre-calibrated FPS 1, FPS 2, RTS, and MOBA settings that deliver the best blend of color and technology for specific gaming scenarios. To lock in that perfect angle necessary for drawn out epic gaming sessions, this monitor features a fully adjustable ergonomic stand capable of considerable swivel, pivot, tilt, and height adjustment. An integrated headphone hook keeps your headphones within arm’s reach, while a cable management ring reduces clutter around your gaming space. With Flicker-Free technology and a Blue Light Filter, this monitor helps to eliminate eyestrain that comes with extended viewing periods – meaning you can outlast and out-game your opponents just as their eyes begin fail them. This monitor features MultiPicture support for multitasking and simultaneous viewing of up to 4 video sources at Full HD 1080p resolution. Picture-in-Picture (PIP) and Picture-by-Picture (PBP) functionality is also available for increased productivity. In addition to Uniformity Correction and independent 6-axis Color, Hue, and Saturation adjustment functions, this monitor also includes 1.07 billion color capabilities and Delta E≤2 color accuracy for complete color customizability. With such vibrant color, this monitor transports you to realms of unmatched gaming visuals. "The well-equipped ViewSonic XG2700-4K is a 27-inch gaming monitor that uses AMD's FreeSync anti-tearing technology and an In-Plane Switching (IPS) panel to deliver ultra-smooth gaming performance and rich, accurate colors." "If you're looking for FreeSync, IPS and Ultra HD in one product, choices are slim. ViewSonic has entered this rarified category with a phenomenal effort in the XG2700-4K. This 27-inch monitor is one of the best displays we've ever tested."